Benjamin Hodson Fitness » Functional Training – choosing the right kit! Functional Training – choosing the right kit! So what is this phenomenon ‘functional training’? The buzzword is banded around far too often. ‘True’ functional training refers to strength training in movements that are replicable to real-life situations and are based on the primal movement patterns of bending, twisting, squatting, lunging, pushing, pulling and gait or the actions of walking and running. Basic functional strength exercises manifest within one direction or single plane of motion and as we develop our functional strength we are capable of combining these movements into multi directional loaded exercises to maximise overall body strength, flexibility, coordination and fitness. The training equipment we will be discussing over the coming weeks encourage this loaded, total body approach. 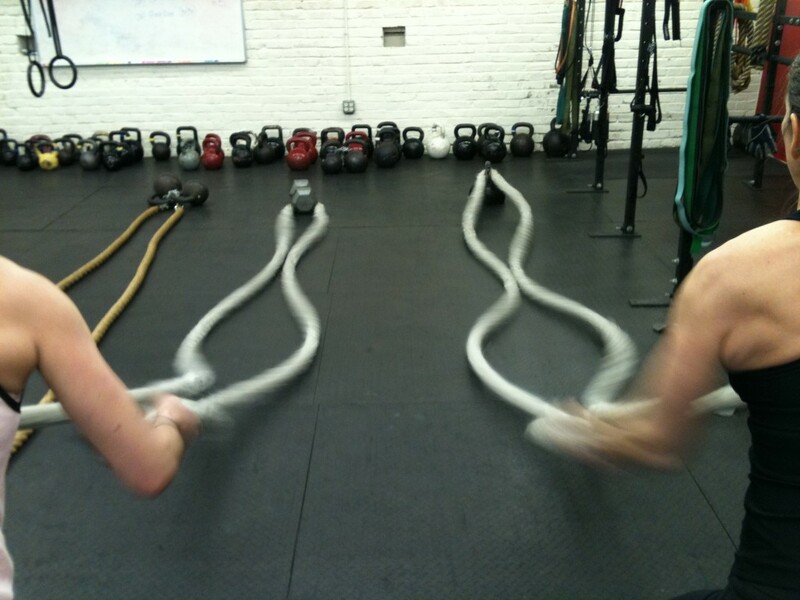 This offering we’ll start with the most recent addition to the fitness industry, the battling rope! I remember these making their debut at the Fitpro Convention at Loughborough four years ago, filtering into contact/ combat studios (MMA, boxing) but they didn’t really emerge into mainstream gyms for wider use until recently. As soon as you engage in the trademark ‘power slam’ exercise (below), you understand why they were so popular with combat sports, recruiting the whole body but particularly shoulders, back and wrists. Add exercises like single and double waves (below), side slams, star jumps and snakes on the floor (below) and you realise this is what high intensity interval training gets its name for. I wouldn’t call this ‘cutting edge’ kit. At the end of the day, all you’re doing is chucking a rope around in as many different ways as possible but it can be used for all abilities and it does create the fun-factor in any circuit, great for an explosive warm-up or an upper body metabolic workout without too much leg action. Battling ropes offer an express workout solution but be wary of using them if you have pre-existing shoulder or wrist injuries and be sure to start off in an instructed setting such as boot camp or in a gym to set technique. All-in-all, a valuable addition to the fitness industry. Quite expensive – Prices range from £60 to £160 depending on the length and diameter. The typical size is 50 feet with 1.5 inch thickness so anchored around an end point leaves you with 25 feet of work distance. Obviously the longer and wider (2 inch) the rope the harder the exercises. Offers a wide range of unique, low impact exercises which are highly upper body dominant. Most people will find it a fun alternative to conventional movements, easy to pick up technique but avoided by shoulder, back or wrist sensitive exercisers. Not very portable as it’s the equivalent of transporting a large snake in a bag and you’ll need a stable anchor point, fixed being better. The home use factor is limited as you’ll also need a large area but perfect around a bench in a park.